A vast walled patch of vacant land stands out amid the golden-brown sands of Askandara village in Jaisalmer. A guard desultorily watches over the emptiness. This 770 hectare plot is the site for two concentrated solar power (CSP) plants of 100 MW each to be built by Lanco Infratech Ltd. Even though the project nears its commissioning deadline in May, only some foundation work had been done when Down To Earth visited the site on April 5. Equipment lay unused and there was no sign of workers. The site should have been decked up with glistening curved mirrors by now. CSP plants use such mirrors to concentrate sunlight, which is then converted into high temperature heat for generating electricity. Lanco is not an isolated case. Six of the seven CSP projects, totalling a capacity of 420 MW, alloted under the first phase of Jawaharlal Nehru National Solar Mission (JNNSM) are running way behind schedule and would miss the May 9 deadline (see ‘Ground reality’). JNNSM aims to generate 20,000 MW of grid-connected power by 2022 through different solar technologies. It was to this end that the Ministry of New and Renewable Energy (MNRE), which is executing the mission, had invited bids for 470 MW of CSP projects in 2010 and had selected seven developers out of 60. 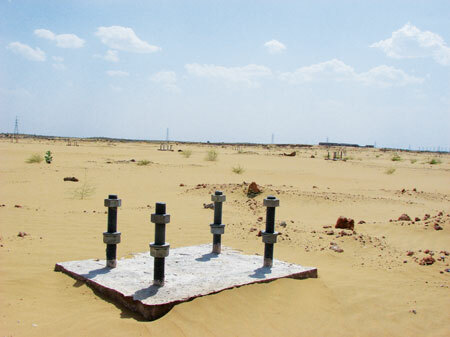 While the first JNNSM phase ended in March 2013, the CSP projects hang by a thread. As per JNNSM guidelines, if a project is delayed, government-owned power purchasing body, NTPC Vidyut Vyapar Nigam Limited (NVVNL), encashes the bank guarantee that the developer had submitted at the time of signing the Power Purchase Agreement (PPA), over a period of three months. After this the developer does not have to pay any penalty for two months. But if the project is still not commissioned, the developer pays Rs 1 lakh/MW/day as penalty for the next three months. After that, the project stands terminated. Fearing heavy penalty, most CSP developers petitioned MNRE to postpone the May deadline by six to 15 months. The deadline was not extended till the story went to the press. However, to save the projects from termination, the ministry released a notification in March to give a further relaxation of 12 months to the developers. But they would lose Rs 1 lakh/MW/day. “This is draconian. It will only discourage developers and no one will put up CSP plants in future,” says a developer, requesting anonymity. MNRE is now considering to reduce the penalty. Reasons for delay in CSP projects are aplenty but the main one is the lack of funds. A CSP plant costs around Rs 13 crore/MW. Most CSP developers have not been able to raise enough money for the projects. According to JNNSM documents, developers had to declare financial closure within six months from the date of signing PPAs in January 2011. An NVVN official says financial closure is the proof of having “substantial” funds. But definition of “substantial” is fuzzy. “We look at a company’s balance sheet and bank certificates to make sure the required amount has been sanctioned,” says the official. However, sanctioning is different from releasing the money, he adds. “Now financial institutions are reluctant to release funds,” says Tarun Kapoor, joint secretary, MNRE. Banks, however, claim to have released the funds for clean players. “Their plants are coming up in time or with short delays,” says an official of a commercial bank, requesting anonymity. Lenders also have other concerns, like faulty Direct Natural Irradiance (DNI) data provided by MNRE. DNI is the amount of solar radiation received per unit area by a surface that is always held perpendicular to the sun rays. It gives an indication of the expected power generation. Developers found on-ground DNI to be 15-20 per cent lower than what MNRE data projected. “We had to redesign our plants,” says Sanjay Varghese, chief operating officer, Lanco Infratech Ltd. This impacted procurement as quantity and design specifications of most components had to be revised. Land requirement, too, increased by 17-19 per cent, he adds. “Lenders are now worried that selected projects might fail to deliver the expected power and thereby not have enough cash to pay back the loans,” says an ICICI bank official. MNRE acknowledges the problem. “This was satellite data taken from National Renewable Energy Laboratory of the US Department of Energy. We did not have any ground data available at that time. This was made clear to the developers,” says Kapoor. Realising the problem, MNRE started installing solar radiation resource assessment stations to collect local DNI data. So far 51 stations have been built across the country. J Srinivasa Rao, chief manager, project finance, State Bank of India (SBI), says lack of CSP performance benchmarks in India is also a problem. “There are no demonstration projects to show us performance specifications about various factors, including power output,” he says. The developers are unable to provide convincing technical and economic feasibility project reports also, he adds. Banks are also concerned that developers have bid very low tariffs and may not be able to make their projects financially viable. The lowest bid was Rs 10.49 per unit. “CSP is expensive and new in the country. 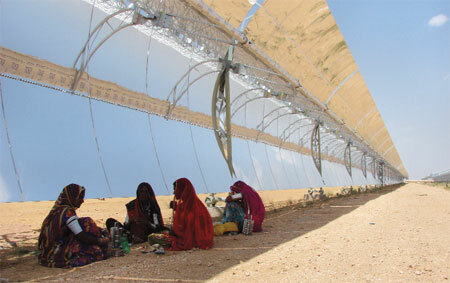 Demonstration of a CSP project’s bankability is crucial,” says Rao. SBI sanctioned money for 20 MW Aurum Renewable Energy Ltd project in Gujarat. But the firm could not raise remaining funds. Lenders fear developers’ condition would worsen as they miss their commissioning deadline and take on heavy penalties. Anurabha Ghosh, director of Council on Energy, Environment and Water, a Delhi-based non profit, says the government should work with banks to alleviate their concerns. “The government will have to take banks into confidence. One way is to give government-backed loan guarantee,” says Ghosh. MNRE officials say they have done their best to convince the banks. “We have conducted workshops with banks and took them abroad to several project sites. Even the finance minister has spoken to them but they are not convinced,” says Kapoor helplessly. Overexposure of banks to conventional power is another problem. “Many Indian banks have reached their credit limit and have limited funds left for solar projects,” says Mohit Anand, senior consultant with Delhi-based Bridge To India that provides consultancy on renewable energy projects. Delayed supply of some components, like heat transfer fluid (HTF) and mirrors, also stalled the projects. HTF absorbs concentrated sunlight and heats up the water, turning it into steam. This steam runs a turbine that generates electricity. There are very few suppliers of HTF in the world. US-based Dow Chemicals and Solutia monopolise the market and have pending delivery schedules due to high demand from projects in the US and Spain. Some Indian developers are still waiting for HTF. Further, desperate demand for HTF has spiked its price by almost 50 per cent in the last two-three years. The current price is around Rs 3,85,000 per tonne. Nearly 1,100 tonne of the fluid is required for a 50 MW project. Developers feel that the commissioning period of 28 months was also overambitious. “All the developers are building CSP for the first time. It is a learning period. We are bound to face problems,” says Varghese. CSP is also facing competition from photovoltaic (PV) technology. Banks are more comfortable in financing PV projects. “Falling prices and better project implementation record of PV modules is making the costly, more complex and time consuming CSP projects less attractive globally,” says Anand. A PV project costs Rs 7 crore/MW as opposed to Rs 13 crore/MW of CSP. However, the CSP technology has distinct advantages over PV. It has a potential for long hours of heat storage, so that electricity can be produced even after sunset. It can supply peak load electricity and can be hybridised with coal, gas and other renewable energy plants. “A solar site is best utilised when it is CSP, provided the government supports it,” says Lavleen Singhal, director of Acira Solar, New Delhi. Project delays and costs can be minimised if domestic CSP manufacturing, which is in infancy, is strengthened. Dhruv Batra, director of Gujarat-based Cargo Power and Infrastructure, told the press that indigenisation will reduce project cost by 40 per cent. His firm is setting up a plant for producing all types of CSP products, including specialised mirrors. Godavari Green Energy Limited (GGEL), a subsidiary of Chhattisgarh-based Hira Group, is the only firm expected to commission its 50 MW CSP plant in time. “We planned our project well and were fortunate to arrange finance in time. HTF orders were placed in advance, knowing it could be a problem,” says J P Tiwari, project head, GGEL. Finance is the sticking point for renewable energy technologies, especially solar. Developers insist renewable energy projects must be classified as a separate sector for financing. Analysts say a mechanism for non-recourse financing is required. It’s a loan where the lender is entitled to repayment only from the profits of the funded project, not from other assets of the borrower. But banks have reservations. They finance only if all risks are covered. In many countries performance guarantee is taken by the engineering procurement and construction (EPC) contractor. EPC pays a penalty to the plant owner if the plant performance ratio is lower than a certain pre-decided limit, says a report on solar projects financing published by Bridge To India in February 2013. The government is exploring options. National Clean Energy Fund, set up in 2011, is expected to be used to give low-interest loans for financing renewable energy projects. Indian Parliament passed the Debts Laws (Amendment) Bill 2011 in December last year to strengthen debt recovery framework. Previously, a debtor was able to get a court stay order on recovery of assets. This delayed recovery of assets by the lenders. The bill restricts any orders by the courts without hearing the lenders. “This can give some comfort to banks,” says Ghosh. Unless the bottlenecks are cleared CSP will struggle to survive in India. Rajsun Technies Pvt Ltd - 100MW is Reliance Power Project in Rajasthan. Any update on their plant thats also delayed.. Thanks Ankur, for an excellent in-depth article on the status of CSP in India. there are lessons to be learnt from countries such as Spain, where a frenzy of solar development has run into massive problems. This article published recently at 'The Tyee offers some very sobering conclusions to those who wish to explore further. Solar energy plants have been making the news headlines for a long time. But it was indeed disappointing to know that the lack in supply of raw materials is making the solar projects again lagging. I hope that the government taken initiatives to implement solar projects soon.